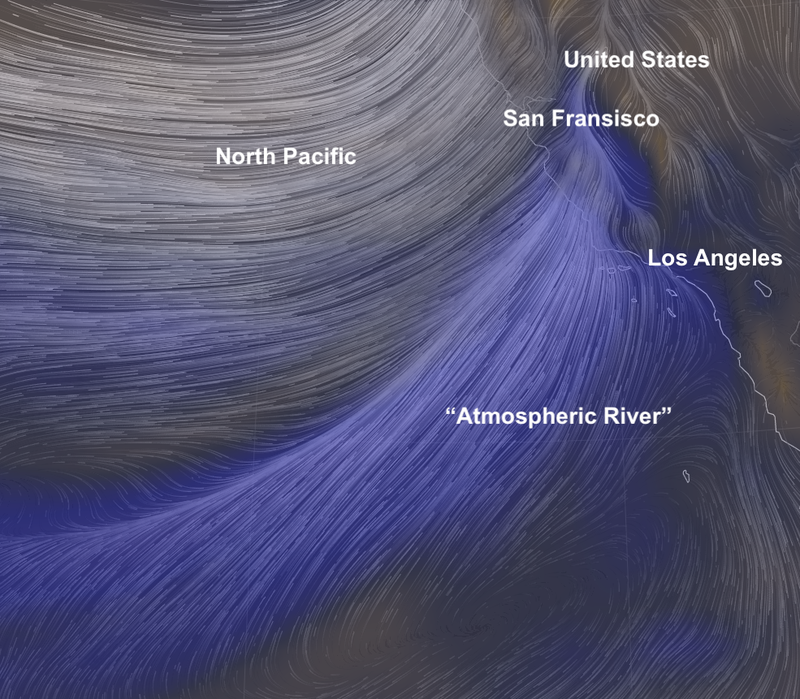 A massive "Atmospheric River" is set to dump nearly 10 feet, 3 metres of snow in California’s Sierra Nevada mountains and several inches of rain elsewhere in the state on Wednesday and Thursday, compounding the flood risk after earlier rainstorms blew through the state. Police in Los Angeles and Santa Barbara counties ordered evacuations Tuesday from areas damaged by last year’s wildfires because of the risk heavy rain would trigger mud and debris flows on charred hillsides. According to Reuters, significant road closures and travel delays were possible in the Los Angeles area given risks of flash flooding and rockslides, the NWS reported. The new storm brewing out at sea will probably bring areas north of Santa Barbara up to 3 inches (7.6 cm) of rain. As much as seven feet of snow was possible over 6,000 feet (1,829 meters) in the Sierra Nevada mountains. The first storm will reach the U.S. Midwest and Northeast on Thursday and Friday, gathering more moisture from the Gulf of Mexico. The second storm will hit the central and eastern United States through the weekend, forecasters said. More than a month’s worth of rain could hit the Los Angeles area over 2 days, AccuWeather forecasts Following one round of rain and mountain snow on Tuesday, an even larger storm system will further raise the risk of flooding, mudslides and avalanches from Wednesday into Thursday. Los Angeles received over 1.75 inches of rain on Monday and Tuesday, and San Diego picked up just over 0.55 of an inch of rain. AccuWeather meteorologists are forecasting that the Los Angeles basin could receive 2-4 more inches of rain beginning Wednesday night and lasting into Thursday night, bringing the potential total up to 5 or more inches. The average rainfall for that area in January is 3.12 inches. "Are you getting these reports from Haarp?" I live on the Northern California coast... and we are being fumigated with chemtrails... many are packing up and moving to where there are no chemtrails. Some think California will be nuked with directed energy weapons via agenda 21. Those asleep at the wheel and do not move out of the war zone will be vaporized like in paradise, CA. I wish this were a joke also, if do your research will awaken to this. Some times easier to just fall asleep, and die ignorant, like thousands do every day with consuming glyphosate foods, drinks, gmo's, medicinals, street drugs, vaccines, media tell-lie-visions etc.... Prayers for USA !!! if you care to explain this amount of chemtrails yesterday. but not seen like this in any previous days for a month, you may change your poor opinion. Theinitiate.... how does it feel to be a sheep? People always focus on the effect, but miss the root cause. EASY answered, "It's all GLOBAL warming". Personally, I am sick and tired of the expedient ,and political correct answers.. And what the H' is the purpose of Chem Trails , anyway. NO politician will never answer a straight question. Every day, things are changing rapidly, and almost too quickly to measure. Earthquakes, wacky weather are all signs of signs .